All of these new Kremlin buildings, as Rossiyskaya Gazeta discovered, are military facilities being constructed for the Presidential Regiment commanded by Maj. Gen. Oleg Galkin. One of them will be commissioned very soon—a sports complex located near the new helipad. After a morning run in the Taynitsky Garden, soldiers of the Presidential Regiment will be able to warm up there. This is the first and only open-air sports complex in the Kremlin. A permanent stable for the Kremlin Cavalry is being built in the Taynitsky Garden. Currently, when the guards need horses for parades, these must be brought in from the countryside. Altogether, the Cavalry Honor Regiment consists of two squads of 108 horses—actually one squadron. The residents can usually see, at best, between 12 and 24 riders during Saturday's ceremonial guard ride on Red Square and Cathedral Square. 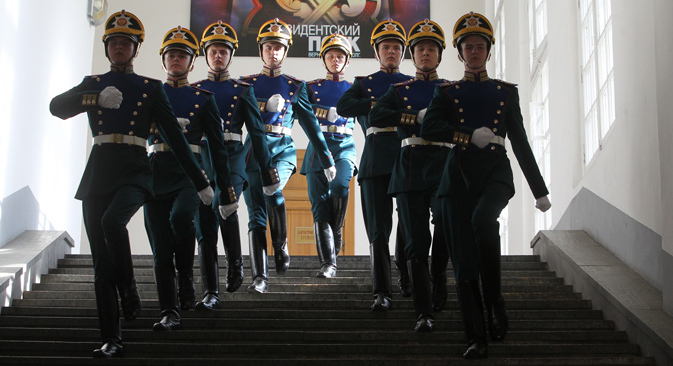 “The Presidential Regiment is our talent pool,” says Gen. Sergey Khlebnikov, commandant of the Kremlin. “Cadets of this regiment serve virtually in all the departments and divisions of the FSO [Federal Protective Service of the RF], as well as in the Ministry of Defense and in various detachments of the Special Forces. From this regiment, many men have risen to the rank of general, or, in civilian life, became mayors and directors of factories. While on duty in Dagestan, Sitnikov killed a suicide bomber, but he was mortally wounded during the fight. Alexei Sergeyevich Sitnikov was posthumously conferred the title of Hero of the Russian Federation. “Such great men are prepared in our regiment,” says Khlebnikov. “There are no tricks against heat, except one; we did not advertise this before, but I think that this is no longer a secret. Previously, when our guards stood at the Lenin Mausoleum in the summer time, when there were no visitors, our detail inside the mausoleum directed a fan toward the guards, through the open door. “When it is cold, only traditional methods are used. Once, we tried installing heaters in the sentry booths. However, at the request of the guards, these were removed. This idea turned out to be worse: In outside temperatures of 25 degrees below zero Celsius [18 degrees below zero Fahrenheit], when you got to the post, your feet would start sweating.